The moogerfooger Ring Modulator's wide-range carrier oscillator and dual waveform LFO mean motion on rhythm tracks and radical low-fidelity textures. The moogerfooger Lowpass Filter's envelope follower delivers classic '60s and '70s sounds on bass and electric guitar. Or dial up fat analog for any instrument using the 2-pole/4-pole variable resonance filter. Groovy! 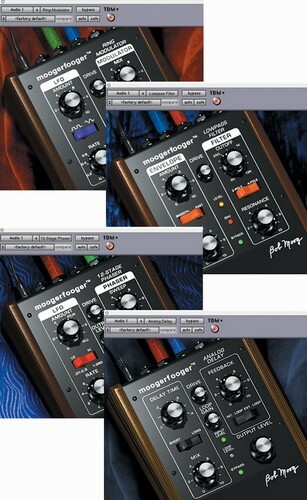 The moogerfooger 12-Stage Phaser combines a switchable 6- or 12-stage phaser with a wide-ranging, variable LFO. Start with subtle tremolo or radical modulation effects, then crank the distortion and resonant filters for unbelievable new sounds. all with the signature classic Moog sound. The moogerfooger Analog Delay is simply the coolest (and warmest!) delay in the digital domain. Due to component shortages, fewer than 1,000 of Bob Moog's "real-world" version will be made. Bomb Factory snagged serial #1 and, as always, meticulously modeled every detail of the classic analog design. Wait until you hear it!